Since our Paper Journals, Notebooks and Leather Diary are made with hard bound handmade paper our stationery items are a wonderful to use. We also have a large variety of letter heads, paper boxes, business cards, Christmas Paper Decorations, office Stationery, Notebooks, Journals, Hangings etc. All the Paper Items like Gift Wraps, Handmade Boxes, Chocolate Boxes, Notebooks, Diaries and Paper Decorations are of high quality paper and match international standards. We are also Social Compliant Paper Unit having Fair Trade & Sedex Certification. Our factory made notebooks and journals are hand crafted making them 100% handmade items. With precise binding or our leather covers with inner handmade paper along with excellent hard bound covers our Paper Gift Items will last as long as you use it. The Recycled Paper Gift Items also makes a ideal gift for students artists and anyone who has the flair to write RECYCLED TRAVEL JOURNAL, hand bound notebook, recycled paper sketchbook, original Eco friendly gift, book lovers and other are our main category items which comes under Handmade Paper Products. While producing Handmade Leather Journals there are approximately 50 leaves made from recycled cotton waste paper. The inside handmade pages are blank/off-white, but some of the recycled printed details can be clearly seen through the paper as the paper is visibly recycled and Environmental Friendly Product. Our Recycled Paper Notebook can come in customized sizes like, A5, A6, A4 and other standard recognized sizes. Our Paper Notebook is a handmade journal sewn in the traditional style with assorted color waxed cotton thread, which is durable and strong. The inside recycled pages are of high quality handmade paper, which is made in house at our factory in Jaipur, eventually made from recycled materials. The traditional binding of this journal allows the book to get completely flat when open, creating its own flat surface for use away from a desk. All Handmade Paper Products especially Handmade Notebook, Leather Journals the inside handmade pages and end pages are made by handmade recycled paper. Our Artisans precisely choose the papers we intend to recycle and to make customized handmade paper notebooks and journals. As some materials commonly recycled to make handmade paper have themselves been recycled and re-used so many times that they have essentially no fiber content. The materials we use are selected to create a strong recycled paper that is soft to the touch, easily worked with, and eco friendly. Each handmade sheet of paper used in our leather notebook, travel journal the inside pages is checked individually at several stages to make sure there are no holes, weak spots, wrinkles, or any other flaws. Starting from agendas to journals, our Travelers Notebooks enable you to do your work in the most flexible and stylish way. These leather notebooks are from India which are highly demanded and often copied. 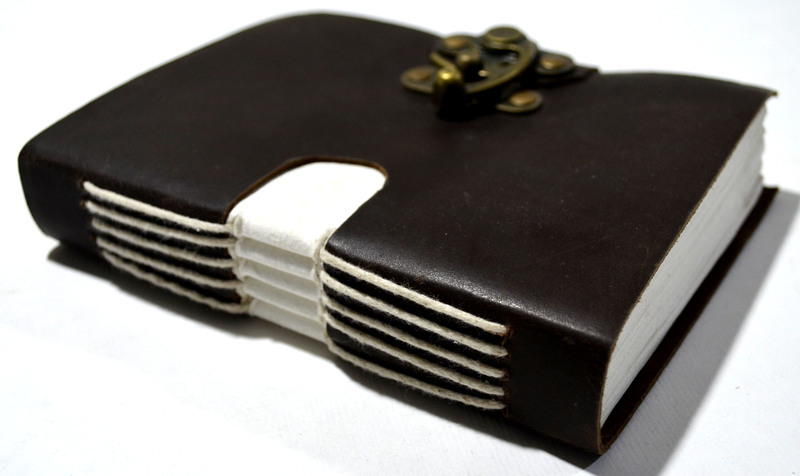 Our Handmade Travel Journal have been Handcrafted by our artisan in house. The travel journal has simplicity and balance as key to their master. Handmade Notebooks are completely Eco-friendly and made from Recycled Materials.